The current phase of restoration of the Pisa Cathedral started 4 years ago, with workers using traditional restoration techniques. But this could soon change thanks to innovative materials being tested. 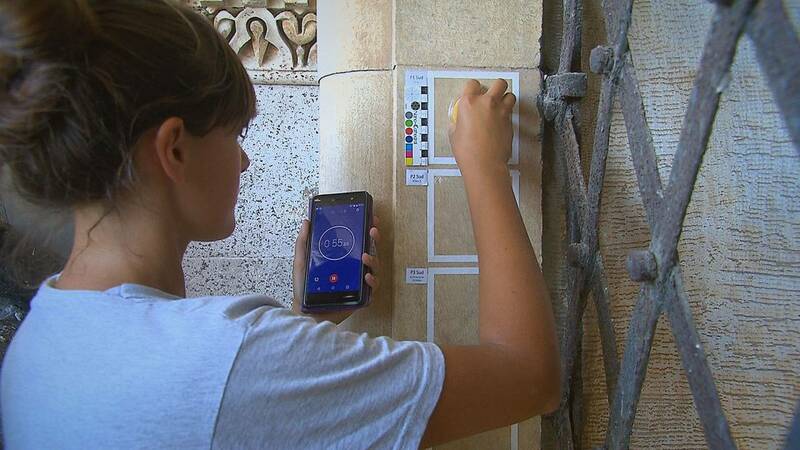 Just a few meters from Pisa’s famous Leaning Tower, restorers are defying scorching temperatures to bring back shine to the city’s Cathedral. Ordinary restoration techniques like laser are being used on much of the stonework that dates back to the 11th century. But a brand new technique is also being used: a new material made of innovative nano-particles. The aim is to consolidate the inner structure of the stones. It’s being applied mainly on marble. “Marble has very low porosity, which means we have to use nanometric particles in order to go deep inside the stone, to ensure that the treatment is both efficient while still allowing the stone to breathe,” explains Roberto Cela, civil engineer at Opera Della Primaziale Pisana. The material developed by the European research team includes calcium carbonate, which is a mix of calcium oxide, water and carbon dioxide. The nano-particles penetrate the stone cementing its decaying structure. “It is important that these particles have the same chemical nature as the stones that are being treated, so that the physical and mechanical processes that occur over time don’t lead to the break-up of the stones,” says Dario Paolucci, chemist at the University of Pisa. Vienna’s St Stephen’s is another of the five cathedrals where the new restoration materials are being tested. The first challenge for researchers is to determine the mechanical characteristics of the cathedral’s stones. Since there are few original samples to work on, they had to figure out a way of “ageing” samples of stones of similar nature to those originally used. Consolidating materials were then applied on a variety of limestones, sandstones and marble – a selection of the different types of stones that were used to build cathedrals around Europe. What researchers are looking for are very specific properties. Further tests are underway in cathedrals across Europe in the hope of better protecting our invaluable cultural heritage.